Best Quality + Service + Price Anywhere! Our photo booth is high quality and elegant with a large array of elegant props that are tailored for your event type or theme. Our booth delivers portrait studio quality photos. Our booth operators are professionals and well-groomed adults, who dress up professionally for your event. We take pride in delivering great automated photography photo booth service to you. We use professional high-end photography studio equipment, including our photography DSLR professional cameras in our booths, the same type of camera used by Photography pros for weddings and in our portrait studio. 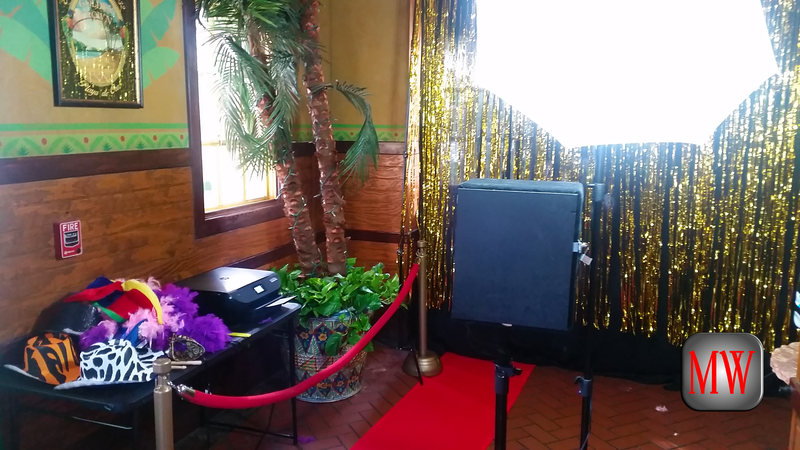 You and your guest will be photographed standing in front of an automated photo booth with our large professional umbrella lighting and a view of themselves on the touch screen photo booth monitor. We stand out from competitors because of our elegant style and appeal of all of our equipment, high quality props and high quality photos. A booth operator will be present for direction. You will pose and make gestures and have the luxury of pushing a take a picture button on the photo booth control panel that the operator will assist you with and push for you while you and your guest pose viewing yourselves on the monitor. You will have one of our backdrop options in the background. 1-15 guests at a time will pose in front of a 10 x 10 backdrop wearing our props of their selection. Customized photo strips with name(s) of honoree(s) or event(s) are available by request in advance. We offer protective disposable linings to be worn under our wigs and hats, which each guest is to put on before and dispose of after wearing our head props. This helps to keep our head props clean. On site, same day printing per group shot is avaialble. In addition, instant social media sharing of photo strips can be shared by each guest and posted on their Facebook or Twitter pages through our photobooth technology. Internet wifi for social media sharing is available by request in advance. Digital photobooth photos will be available to be emailed to all registered guest. Each PhotoBooth occupant will register their email on our computer and agree to MovieWhip PhotoBooth-VideoBooth terms, before they handle our props and enter the booth. 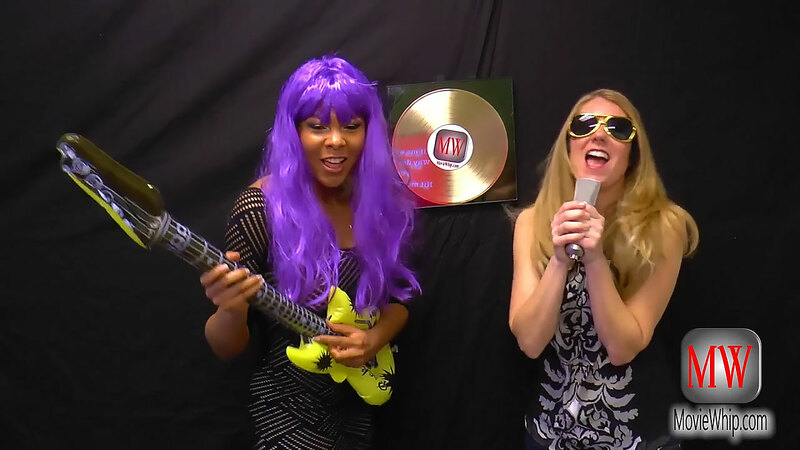 We offer our VideoBooth lip sync Karaoke with normal and slow motion video pop or rock music video edits of your guest dancing and lip singing while wearing our rock wigs, hats, guitars, drum sticks, etc, in a real looking studio setting. Our VideoBooth operator will direct you and your guest. Each group of 1 - 9 guests at a time, for 1 -2 minutes, will dance and lip sync sing along to the Karaoke words we provide on the front monitor, in the booth, to a popular rock or pop music chorus selection of their choice (or seasonal - specific genre music options) from our selection of music from the 50's to a present day hit. We play music at a suitable, low volume for those in the booth and near to hear, while the booth occupants inside sing along. The final video edit of your guests' performances will be emailed in a link to you & your guests, with an overlay of the music chorus selections at a normal loud playback volume on the edited videos, that you and your guests can share with family and friends. You and your guests have an option to be recorded to offer a video and audio contribution in honor of the host in the last 5 - 10 seconds of any VideoBooth options we offer (optional as the only video type with a normal, black backdrop and no studio staging ). The setting with a black 10 x 12 backdrop and framed record label gives the presentation of a real small to mid-size microphone music studio booth. The backdrop contains a framed gold 45 LP record award, centerend and hanging on the backdrop with the "MW" (MovieWhip) label on the LP, 1 studio mic on a stand and fake guitars, drums sticks, wigs and hats as props. Professional staged lighting will be in place for professional quality videos. We offer protective, disposable linings to be worn under our wigs and hats, which each guest is to put on before and dispose of after wearing our head props. This helps to keep our head props clean. A sharable, video link containing the VideoBooth edited videos of you and your guest will be available to be emailed to you and your guest in 2 - 5 business days after the service date. An optional hard copy MP4 on a data DVD will be mailed to you or shared through Google Drive for you to download, in addition to your video link as you request. Each VideoBooth occupant will register their email on our computer and agree to MovieWhip PhotoBooth-VideoBooth terms, before they handle our props and enter the booth.